At the Baobab Beach Resort and Spa our sea view bungalows have been specifically designed to provide paramount comfort and luxury for all. Baobab Beach Resort & Spa is located on a cliff-top overlooking the famous Diani Beach, just 38km from Mombasa. Set in 35 acres of indigenous forest, this spacious resort has recently been extensively renovated and expanded and is now firmly established as one of Kenya’s leading ‘all-inclusive’ hotels. The resort is an oasis of tranquillity and serenity, the Resort’s picturesque location is nestled on a coral headland overlooking vast stretches of golden beach. Shaded by indigenous coastal vegetation and exotic coconut palms the resort stretches over 500 metres of golden beach front offering the ultimate luxury beach holiday. At the Baobab Beach Resort and Spa guestrooms have been specifically designed to provide paramount comfort and luxury for all. Each wing offers a unique ambiance ensuring pure relaxation and comfort. All rooms are refined and fitted with all modern amenities with private terrace or balcony, offering a variety of spectacular ocean, pool and garden views. Large inter-connecting rooms are available which are ideal of familes. The rooms come with a King size or twin beds, en-suite shower/WC, individual air conditioning, direct dial telephone, mini refrigerator, electronic safe, shaver outlets (240/110V), balcony or terrace, interconnecting rooms for families, hair dryer and a TV. 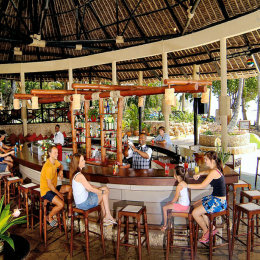 Savour a rich and varied choice of imaginative cuisines at The Baobab Beach Resort & Spa. With fresh seafood harvested from the Indian Ocean, mouth watering exotic fruits and a delicious range of international and traditional dishes served in a choice of exquisite settings. The Baobab Beach Resort has a selection of bars, lounges and restaurants offering a delectable range of international, African and seafood dishes accompanied by a wide selection of fine wines. This was my third stay in this hotel - this means alot! I tested four or five hotels on Diani beach but for me it is the best. Apart from its main negative point, being away from Mombasa (ferry) and Nakumat Mall, its structure consists of three zones (Baobab: 30 years old, center, Maridadi : latest and very quiet or Kole Kole : with more animations.) It includes three very different areas that one can move from one to the other as one desires and at any time of day. It has three beautiful pools too, along the ocean. The evening entertainment (9:30 p.m.) is worthy of the Mediterranean club! The cuisine is excellent and the chef is always present to receive many compliments. The Indian influences on the menu, delicious ! The staff is perfect, all nicer than each other for proof! Some people come back 10 or 20 times and I am definitely going back too! An enjoyable stay overall. There were a few problems with the room: safe not working and AC not responding to remote control. The service we felt could have been better outside meal times - we had to go to the bar each time to order drinks as there were hardly any waiters to place orders with. Overall it was a pleasant experience and we would go back again.